The key political problem of the conflict – the political regime in Ukraine and its future – is far from resolution. The status quo established in the country does not suit the population of Donbass. The "bad peace" will be extended. The "Normandy Four" consisting of the heads of state, government and Foreign Ministries of Russia, Ukraine, Germany and France has been in existence for one and a half years and has been the principal international mechanism for settlement of the Ukrainian crisis. It is the "Four" who made the key political decisions while the OSCE Contact Group that played the first violin in the political settlement process back in the summer of 2014 was repurposed into a technical executive. The main decision – basically the only document hammered out by the "Four" – is the so-called Minsk II Agreement, the Declaration of the "Four" passed on February 12 after 12-hour negotiations, buttressing the complex of measures for realization of the Minsk Agreements and containing the chief principle of political settlement of the Ukrainian conflict. It can be formulated as "peace in exchange for constitutional reform". The current summit in Paris is the fourth full president-level face-to-face meeting of the "Four". Besides tete-a-tete meetings, it has been highlighted by six rounds of negotiations by phone. The "Four" assembled 11 times throughout the last 15 months at the level of foreign ministers. However, despite the quite intensive nature of the "Four's" activities, the conflict is far from resolution. The inception of the format has not put an end to the war, its most active phase happened in late 2014. Then, although high-scale military operations ceased, skirmishes and gunfire have been ongoing practically day and night. The fact that the Minsk Agreements are violated is probably one of the few assertions all members of the "Four" agree on. Finally, the key political problem of the conflict – the political regime in Ukraine and its future – is far from resolution. It is common knowledge that the political status quo established in the country after the coup d'etat of February 21, 2014, does not suit the population of Donbass, while the new Kiev government and its Western patrons are doing their utmost to preserve it and safeguard reintegration of Donbass on its basis. The constitutional reform – something that could have provided a new political status quo in Ukraine and, therefore, settled the conflict – is being crossed out in every possible way, and Kiev is openly refusing to launch the negotiations with the self-proclaimed DPR and LPR as was stipulated in the Minsk Agreements of February 2015. 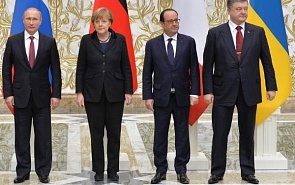 The parties interpret the Minsk commitments in a fundamentally different way. As a result, the transition of the border between the self-proclaimed republics of Donbass and Russia to Kiev's control is postponed indefinitely. Meanwhile, the DPR and LPR are switching to ruble payments, their economic and cultural ties with Ukraine are dwindling. Thus, there is transnistrization of the conflict, its "freezing" instead of resolution based on a new All-Ukrainian political status quo. The DPR and LPR would most likely remain entities de facto independent from Ukraine but de jure part of its territory under Russia's subsistence and within approximately the current boundaries for an indefinite span of time. In the future, the situation will be able to transform either into reunification of the country on the ground of federalization and constitutional reform or into a new war. Hence many people wonder: how effective is the Normandy format? Should it be replaced or adjusted? For instance, by complementing it with the US, who has one of the greatest influences on the conduct of the current Ukraine and development of common modalities in the dialogue with Russia both from the standpoint of the Ukrainian crisis and the prospects of its relations with the West as a whole. Or, perhaps, the format should be supplemented by the High Representative of the European Union for Foreign Affairs and Security Policy or the President of the European Council, or use them as representatives of EU institutions to replace the leaders of Germany and France. Yet, such a reform would have been unnecessary and even harmful. Considering the acuteness and the nature of the Ukrainian conflict, intransigence of the parties' positions, factors of the current balance of forces in the EU and the spirit of Russia's relations with different players in the West, the "Normandy Four" in its current composition seems like the best format for settlement. Its efficiency should be assessed in terms of prevention of a "major war" in Europe and development of the key settlement principle, and not through the prism of the Ukrainian conflict resolution – in fact it is impossible at the moment. When evaluating the efficiency of the "Normandy Four", one should remember that the Ukrainian conflict is less a clash for Ukraine, its national political regime and foreign policy orientation but more for the rules of the international order and relations between great powers in particular. It predetermines the acuteness and the depth of the confrontation, the prospects of overcoming which are vague, sadly. The positions of the parties are intransigent indeed. For Russia, interference of the West in the political processes of Ukraine in late 2013 – early 2014, support of another "colour revolution" and the rapid consolidation of the outcomes of its foreign policy has become not only an infringement of vital interests but also a crude violation of game rules as a whole, an extravagation far beyond the permissible and the non-permissible in relations between great powers. In this context, for Moscow the change of the political and foreign policy status quo in Ukraine is not only a matter of protection of interests in a neighbouring state and in the post-Soviet space as a whole, it is, first and foremost, a matter of international status and position of Russia, a matter of international order. In the eyes of the West, Moscow's response to the Ukrainian coup d'etat and to the role the West played in it has become one of the heaviest blows to the US- and Western European-backed project of the "liberal world order" based on Western rules, institutions and US leadership. Washington took Moscow's actions as a direct challenge to its global leadership and order, which, according to the United States' understanding, should have been established after America's "victory" in the Cold War. EU states (especially Germany) perceived it as a devastating blow to their nurtured idea of "Greater Europe" reaching the borders of China and fully oriented towards the European Union, idea of Europe where Ukraine and ultimately Russia are associated according to EU rules. Against this background, prevention of changes in the current status quo in Ukraine in 2014, its retention in the Western orbit is also a matter of position in the world and development of the world order as a whole for the US and the EU. Taking into account the systemic nature of the conflict and the intransigence of the parties' positions, elaboration of the main political principle of settlement (peace in exchange for constitutional reform) by the "Four" is an enormous achievement. It is an achievement preeminently based on the Russian approach. Of course, the devil is in the details as always. Ukraine and the West are doing their best to interpret the commitment in a minimalistic and selective manner, simultaneously referring to reluctance of the DPR and LPR to resume the war due to the inevitability of harsher sanctions against Russia, who is already in a complicated economic situation. Nonetheless, the development of this principle outlines the settlement contours and gives way to debates that reintegration of the DPR and LPR into Ukraine is only possible after introduction of a change to the political status quo there. In other words, after a constitutional reform. As soon as the principle gained approval in February 2015, active military operations in Donbass ceased. At the same time, the "Four" made a real contribution to prevention of hostilities: Berlin and Paris exert serious influence on Kiev both in averting military escalation and in its fulfillment of the political commitments stipulated by the Minsk Declaration. If no such work were conducted or if the "Four" were inexistent, a war would have erupted long ago. Or, more likely, it would have been ongoing since the summer of 2014. Even debates about extension of the deadline for implementation of the Minsk Declaration (originally set for late 2015) to the next year displays the "Four's" pivotal role in preventing a new bout of escalation. Indeed, the other side of the coin of such an extension is Transnistrization of the conflict. On the other hand, as they say, there never was a good war or a bad peace. And the principle of "peace in exchange for a constitutional reform" has never been scrapped. The very existence and continuation of the negotiation process enables the "Four" to keep Obama's administration in a sort of a rearguard of the political settlement and prevents him from taking the process into his own hands. In addition, it stops him from sending "lethal" armaments and vehicles to Kiev that would have doubtlessly incited a new round of military escalation. Should the "Four" vanish or the negotiation process be put on hold, the current or the following US administration would have to withstand higher pressure from the Congress and warmongers demanding more decisive military aid for Ukraine. That would most likely spark not only new escalation of military operations in Donbass, but also pave the way for a real threat of direct Russia-NATO military confrontation. In general, the format of the "Four" bears the lowest potential for escalation. Its formation in the summer of 2014 was motivated by unwillingness of Germany and France to allow further aggravation of the war in the Southeast of Ukraine and intensify confrontation between Russia and the West. Berlin and Paris are clearly trying to fix Ukraine in the orbit of the EU and the West as a whole, to preserve the status quo established in the country in February 2014 and to push the Russian policy back towards Eurocentrism. However, not at the cost of another Cold War or, worse, "heated" confrontation. They seriously fear direct Russia-NATO confrontation and appearance of a new deep longstanding borderline in Europe, understanding that it would weaken their security and greatly worsen the international position. The idea of "Greater Europe" ranging from the Atlantic to the Pacific Ocean and oriented towards the EU would be put out of mind for a long time. That is why, seeing the obvious inability of the OSCE Contact Group or the Geneva Format (where the US takes part) to attain de-escalation, A. Merkel and F. Hollande decided to create the only format capable of at least preventing degeneration of the Ukrainian crisis into a full-scale cold or even hot war. It is the only format because, on the one hand, it includes states with the most moderate and constructive alignment towards Russia. Germany and France are firm advocates of a strategic partnership with Russia and the idea that European security cannot be maintained without Russia or against it, Europe per se is incomplete without it. Participation of much harsher-aligned US, Poland or the UK in the negotiation process would have definitely blocked even the results the "Four" have achieved thus far. On the other hand, the format clearly reflects the balance of forces created in the EU, namely, the build-up of the leader's power in the hands of one country, Germany. It is quite likely that the period of exclusive leadership of Berlin in the EU will be short and will kick-start processes, principally centrifugal and fragmentational which will change the countenance of the organization. They have already begun. However, Germany practically fully governs the policy of the European Union on the most essential domestic (debt crisis) and external (TTIP negotiations, Ukrainian crisis) vectors. Therefore, if there is anyone who should negotiate all the most crucial political issues with Russia, it is only Germany. High Representative F. Mogherini plays an important, albeit predominantly technical, role. Yet, participation in negotiations with Russia and Ukraine unilaterally would be rather erroneous for Berlin, from the standpoint of relations with Moscow and Kiev and, more importantly, with other countries of the European Union. Participation of France (a permanent member of the UN Security Council among other things) adds weight and representativity to the format, guarantees wide support to agreements reached in the EU and the UN Security Council. Finally, Paris' involvement in the Normandy format is objectively beneficial for Moscow: France takes an even more moderate stance and makes it clear that cooperation with Moscow in combating the Islamic State is just as important as the Ukrainian crisis, while ISIS itself is a lot more topical for it than the situation in Ukraine. Moscow will definitely make use of it in the mean time in the context of potential direct involvement of Russia in the fight against the Islamic State as the leader of the second anti-ISIS coalition. Therefore, the Normandy format is a compromise between the two pivotal goals of the peacekeeping process: de-escalation and representativity. It includes the leaders of the West, who can theoretically conduct dialogue with Russia in the current situation, yet still leaders. There is no substitution for the "Four". It handles the mission of preventing a "major war" well. The problems of greater achievements are essentially an outcome of the failure to solve the Ukrainian crisis at its current stage. That is the standpoint to view the meeting of V. Putin, A. Merkel, F. Hollande and P. Poroshenko in Paris on October 2. No bigger breakthrough is anticipated. However, the "bad peace" will be extended, just as the main principle of political settlement will be reaffirmed. The key political problem of the conflict – the political regime in Ukraine and its future – is far from resolution. The status quo established in the country does not suit the population of Donbass.